On Friday 14th September 2018, here in Archives & Collections at the Library of Birmingham, we held a Creative Writing workshop using First World War archives. #B*gger Brexit as King George the Fifth once said about Bognor Regis! Art Deco in architecture……….form over function……one of the best and most artistic movements in modern architecture…. The bold, geometric, decorative look of Art Deco originated in France in the 1920s. It gained prominence in architectural design and was heavily influenced by Egypt – particularly after the high profile discovery of Tutankhamun’s tomb in 1922. During the 1930s, the style was widely adopted through Western Europe and the United States. A sleeker more cosmopolitan development of Art Nouveau, Art Deco was first used on public and commercial buildings for both its practicality and modern design. Signature characteristics of Art Deco include geometric shapes and angular corners broken up by ornamental motifs. Entrances are often extravagant, roofs tend to be flat and windows can made up of continuous bands of glass. 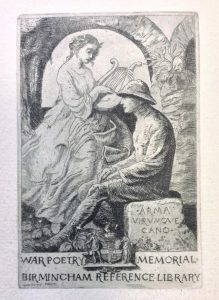 Book Plate from the Catalogue of the War Poetry Collection. 1921. L52.31. The War Poetry Collection was presented to the Birmingham Reference Library in 1921 by an anonymous donor, in memory of William John Billington, 2/24 London Regiment, (Queen’s Hussars), 60th Division, formerly 2/2 South Midlands Field Ambulance, who was killed in action at Abu Tellul Ridge in Palestine on 9 March 1918. The donor was William Cross of Rubery, who had assembled an unrivalled collection of 1,233 books and pamphlets of poetry relating to the First World War, written by both soldiers and civilians. 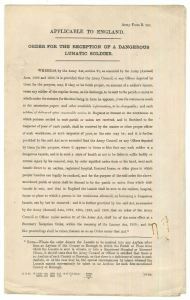 Included are poems in English, Breton, Czech, Danish, French, Gaelic, German (Swiss), Italian, and Latin, by members of the British and Allied Nations. There is poetry which was published in Britain, Canada, Australia, America and Barbados.